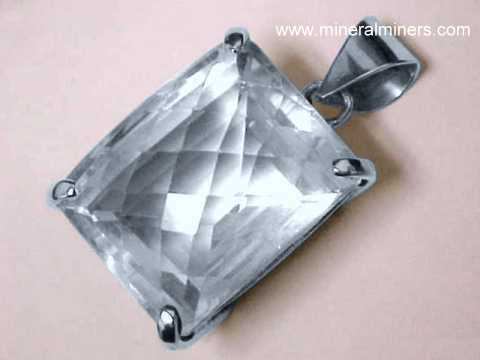 Try our Natural Quartz Crystal Carvings & Handcrafted Items Satisfaction Guarantee - compare our prices and our superior quality. 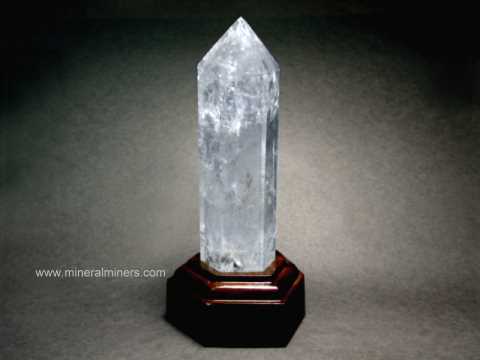 Click on any hand carved rock crystal quartz carving (quartz crystal sculpture) below to enlarge it. This genuine quartz crystal angel carving measures 3.8" tall x 2.3" x 1.2"
This 3.8 inch tall quartz crystal angel is transparent. 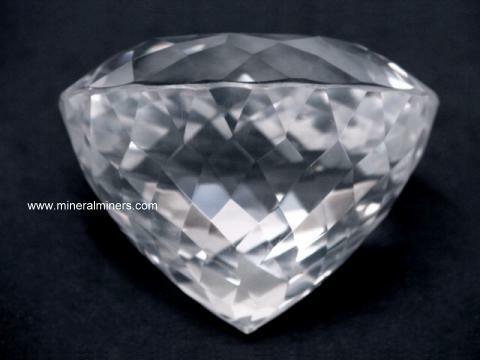 It was hand-carved from a single crystal of lightly included natural quartz crystal that was mined in Brazil. See also an opposite view of this hand-carved quartz crystal angel. 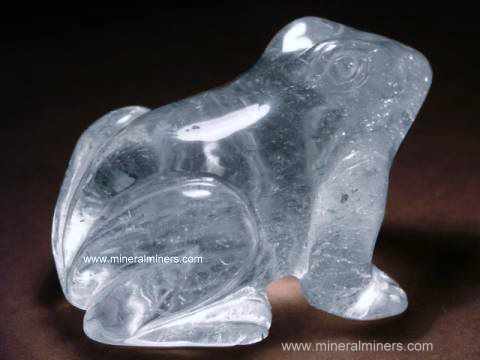 This genuine quartz crystal frog carving measures 3.4" x 2.3" x 1.9"
This 3.4 inch long quartz crystal frog is transparent. 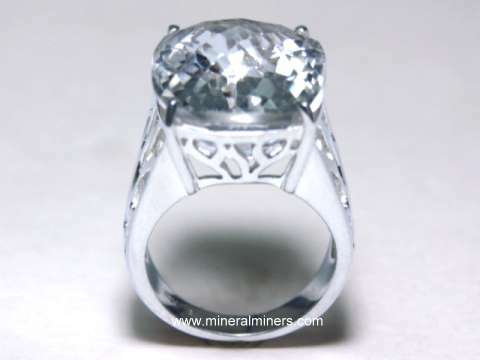 It was hand-carved from a single crystal of lightly included natural quartz crystal that was mined in Brazil. This genuine quartz crystal angel carving stands 5" tall x 2.4" x 1.4"
This 5 inch tall quartz crystal angel is transparent. It was hand-carved from a single crystal of lightly included natural quartz crystal that was mined in Brazil. See a back view of this genuine quartz crystal angel carving. See also a side view of this handcarved quartz crystal angel. This genuine quartz crystal angel carving is 8.5" tall x 3.2" x 1.8"
This 8.5 inch tall quartz crystal angel is transparent. It was hand-carved from a single crystal of lightly included natural quartz crystal that was mined in Brazil. See a back view of this quartz crystal angel carving. See also a side view of this handcarved quartz crystal angel. 2.1" x 1.8" x 1.1"
This chunk of natural quartz crystal has good internal transparency with natural inclusions and long slender rutiles inside. One surface was polished as a "window" to look inside the quartz where a very fine quality internal carving of a dolphin is clearly visible. The dolphin in this stone measures 0.8"long x 0.6" wide. See also a full-view photo of this unique internally carved quartz specimen. This genuine quartz crystal Crocodile carving measures 6.5" long x 2.75" x 1.7"
This 6.5 inch long quartz crystal crocodile is somewhat cloudy and semi-transparent with internal inclusions and planes. 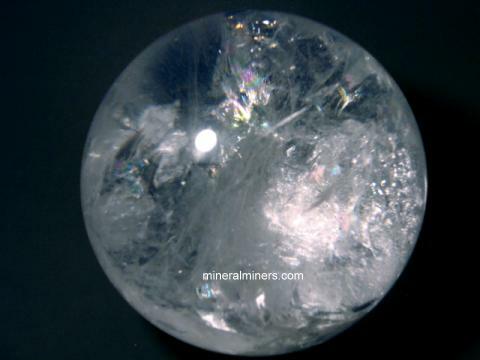 It was hand-carved from a single crystal of natural quartz crystal that was mined in Brazil. 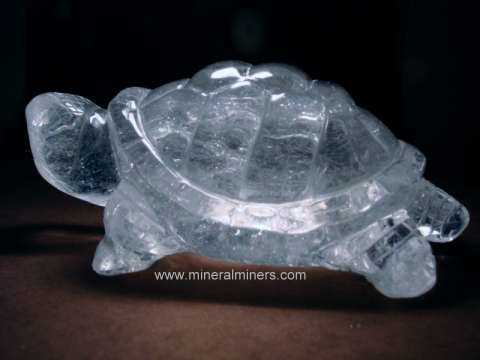 This genuine quartz crystal turtle carving measures 5.7" x 3.4" x 2.3"
This 5.7 inch long quartz crystal turtle is transparent. 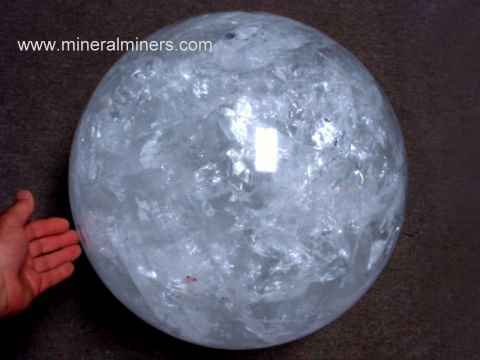 It weighs 1.8 pounds and was hand-carved from a single crystal of lightly included natural quartz crystal that was mined in Brazil. 4.2" long x 0.9" x 7"
This polished quartz crystal massage wand has very good transparency. It is rounded on one end for massage or metaphysical use. 5" long x 1.3" x 0.9"
This 5 inch long polished quartz crystal massage wand has very good transparency. It is rounded on one end for massage or metaphysical use. This fine quality quartz crystal heart has rare transparency with long slender curving rutile crystal inclusions passing thru the otherwise flawless smoky quartz crystal! The beautiful rutile needles are densely packed in some areas. This heart carving was hand-ground and polished from a natural quartz crystal that was mined in Brazil. The quartz has natural light smoky color. The photo at left shows a back-lit view, see also a another view of this rare quality rutilated quartz heart carving. available in assorted sizes up to 2.2" long! 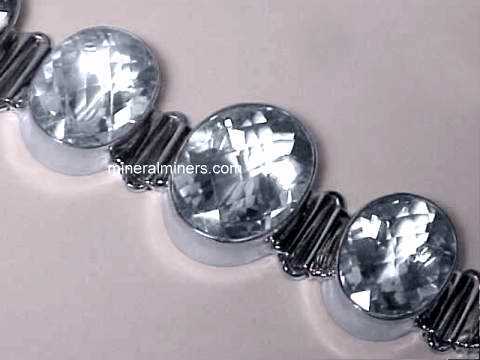 These high quality polished quartz crystal pieces are completely colorless. They have superb transparency, and each piece has large flawless areas! 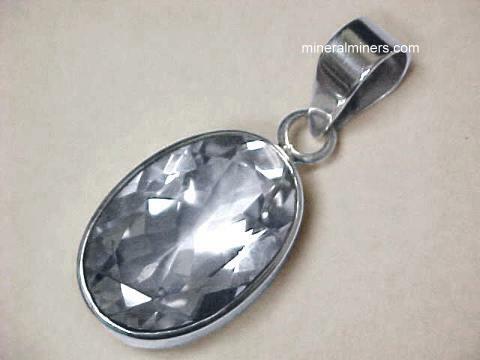 They were tumble polished from 100% natural quartz crystals that were mined in Minas Gerais, Brazil. 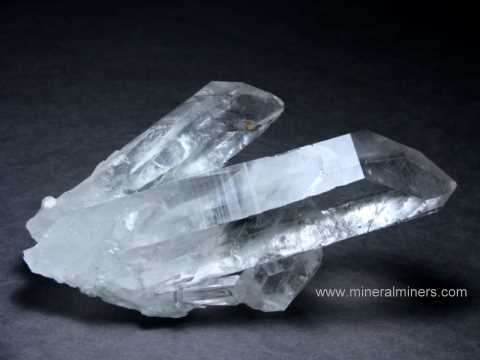 These smooth pieces of clear natural quartz crystal are very popular for metaphysical purposes, and they fit comfortably in your hand or pocket with no sharp edges. 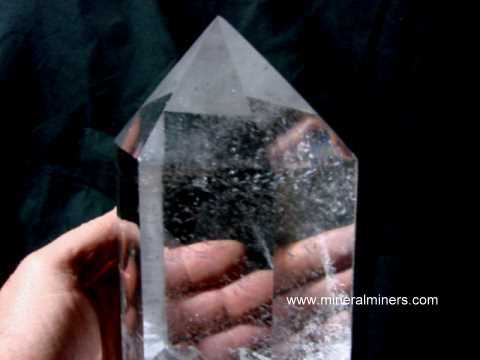 We have several large and extra-large sizes of these superior grade tumbled quartz crystal pieces available at specially discounted volume prices. Please see below for prices, quantities, and ordering. One Pound Rutilated Quartz Crystal Rough with "Window"
This piece of natural rutilated quartz crystal was discovered in an ancient river bed near Diamantina, Brazil. 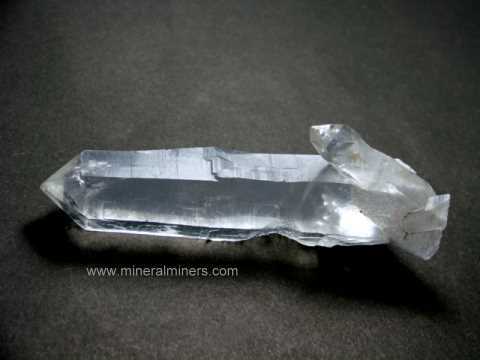 Its surface is naturally stream-rolled, and we made a saw cut on one end which we polished, making a "window" to see into the clear interior of the quartz crystal. 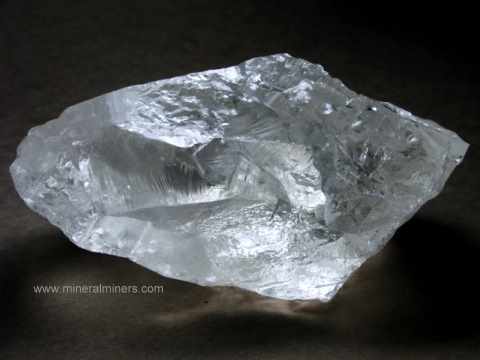 Its interior has excellent transparency with some long curving rutile needles passing through it! 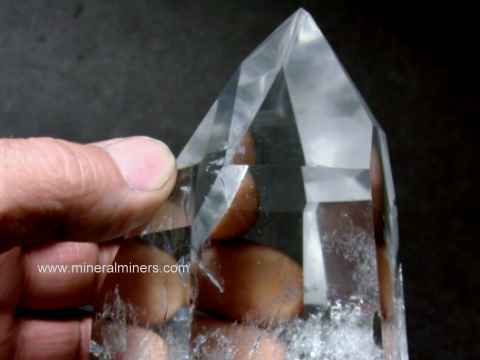 See another photo of this see also a another view of this rare quality quartz crystal window specimen. This lightly included crystal skull is mostly transparent. 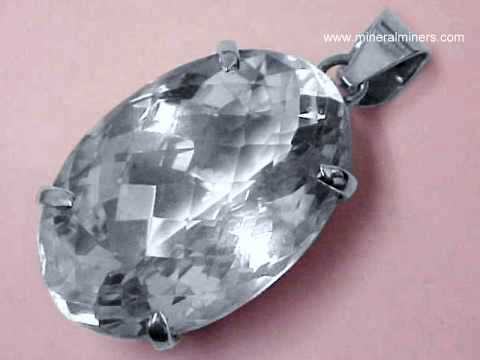 It was carved by hand from a single natural colorless quartz crystal in North-Eastern Brazil. See also a side-view photo of this unique crystal skull. This genuine crystal skull is transparent. 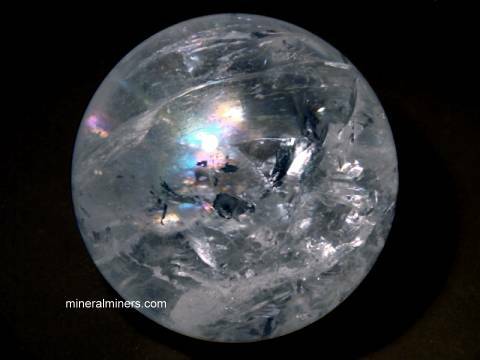 It was carved by hand from a single natural colorless quartz crystal in North-Eastern Brazil. See also a side-view photo of this unique crystal skull. This genuine crystal skull was carved by hand from a single natural colorless quartz crystal in North-Eastern Brazil. This unique crystal skull is transparent. See also a side-view photo of this genuine crystal skull. Crystal Skull, 3.6 inches long! Crystal Skull Dimensions: 3.6" x 3.2" x 2.4"
This genuine crystal skull was carved by hand from a single natural colorless quartz crystal. This genuine quartz crystal skull came from North-Eastern Brazil. This unique crystal skull is mostly transparent with a cloudy area. See also a side-view photo of this genuine crystal skull. This genuine crystal skull is transparent. It has some internal planes with colorful rainbow reflections. This crystal skull was carved by hand from a single natural colorless quartz crystal in North-Eastern Brazil. See also a front-view photo of this unique quartz crystal skull. 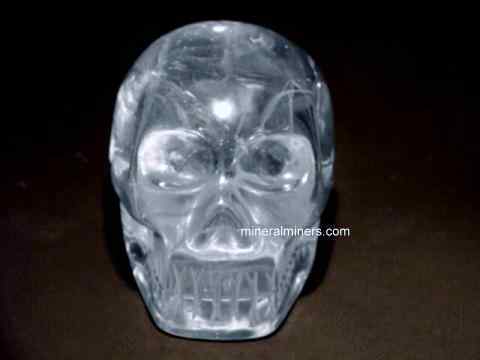 This genuine crystal skull was carved by hand from a single natural colorless quartz crystal. This unique quartz crystal skull came from North-Eastern Brazil. This hand-carved crystal skull is transparent with planes and veils inside. See also a front-view photo of this genuine quartz crystal skull. This genuine crystal skull is mostly transparent. It has internal planes and veils. This crystal skull was carved by hand from a single natural colorless quartz crystal in North-Eastern Brazil. See also a side-view photo of this unique quartz crystal skull. This genuine crystal skull was carved by hand from a single natural quartz crystal. This unique quartz crystal skull is transparent! See also another side-view photo of this genuine crystal skull. See also a front view photo of this quartz crystal skull. This large crystal skull was carved by hand from a single natural colorless quartz crystal. This unique quartz crystal skull has good transparency! See a front-lit side view photo of this authentic crystal skull. See also a back-lit side-view photo of this genuine crystal skull. These genuine crystal skulls were carved by hand from natural colorless quartz crystals found in North-Eastern Brazil. These transparent crystal skulls are lightly included. See also another view of these genuine quartz crystal skulls. We have these small hand-carved crystal skulls available in two sizes: 1.8 inches long and 2.1 inches long. Please see below to order. 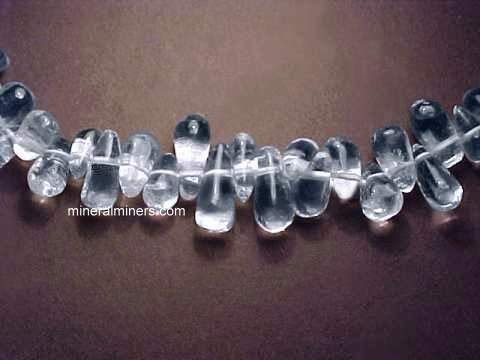 Our natural Rock Crystal Quartz Carvings were all hand carved from natural quartz crystals mined in Brazil. We also have natural quartz crystal gemstones set into handcrafted one-of-a-kind quartz crystal jewelry designs in rings, pendants, earrings, necklaces and bracelets. See also our page displaying jasper carvings & jasper free form sculptures, and our page displaying all of our Collectable Animal Carvings & Free Form Mineral Sculptures. 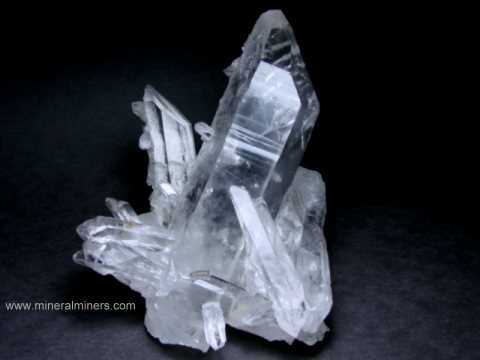 To see more rock crystal quartz photos, just select another Natural Rock Crystal Quartz linked image displayed below. 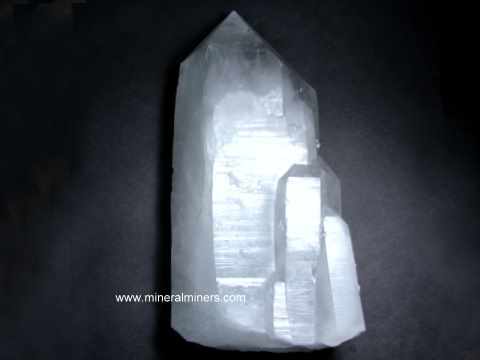 Would you like us to inform you when we add on this page more natural quartz crystal (natural rock crystal quartz) carvings and other handcrafted quartz crystal items? We literally have tons of natural quartz crystal items in stock at our mineral warehouses, so be sure to let us know if you have any special requests. Please contact our webmaster or our 'site' geologist with any questions or comments.